I love how the French wear scarves. I like the idea of the outfit but I do think it makes his legs looks way too short. yes, young. that said he looks like he's warm. okay, the proportions are a weird. mmmmphm. oh, i dont know, it's something weird in proportions. The LL Bean Sweater is so dope and the way he puts it together. perfection. Very Parisian with the bags. I love the shoes. I'm in love! He projects awesomeness. "Yay" to shoes and the canvas bag with the leather corners and the whole damn outfit for being unique. Magnificent (minus the footwear). Great ideas, old fabrics. Bags are eco-friendly, showing he cares. um … llbean? is that strange to anybody else? this is kinda like if will forte was a frenchman. I guess this is the Parisian equivalent of going to the market in a track or jogging suit, sloppy yet somehow and somewhat stylish. Well, it's all about the bearing. Nothing to do with anything in particular but how he interprets what inspires him. And who he is. Beautiful. Not a fan of the proportions, either. I like the colors and textures, though. Love it all. The socks over the trousers especially. If only they made pants like that in women's sizes. The contrasting greys and neutrals… the parka jacket, perfectly suited for the weather, comfortable yet stylish. From the knees down – holla!! Yes, he looks short but comfy too!!! He may be a dancer,kudos on the parisian wearing scarfs! hmmmmm… I'm not a fan. It's too sloppy. Looks like he is wearing his slippers and pj bottoms. The color palatte is nice as well as the canvas bag ! I just can't get behind his pants tucked into his socks. Seperately, I'm not too fond of any of the articles of clothing, but together as a whole, that outfit is fantastic. Forget the clothes . . . He's super cute. where can I get this kind of vintage bag in manhattan?? The length of his sweater causes the strange proportions. He may be Parisian, but he is all Danish! :) Go Kasper! Very very stylish! Great layering lesson! And definitely something I will wear! Thank you for sharing this! Truly inspirational! We love that outfit, so nice! Although I dislike the articles, the fit and personalised nuances, the colours he wears make it seem as though a part of the streetscape has come alive. That has to be admired. ..i think his look in the eyes is kinda nice – but i can image him really good in a white tshirt and very used jeans..i somehow do not like this style..too much of used brown! I love the soft color, the French, and especially the Parisians are so good at that! His look reminds me of the Syrian peasants walking down the city streets of Aleppo in Syria. This picture calls to my mind a conversation between my brother and I once in Munich Airport summer of 2009 looking at a French store mannequins and speaking about my trip to France. He looked at me and said, "Well, don't go all French and come back wearing those peasant-style baggy pants declaring it to be fashionable!" It wouldn't be fair to agree with him now looking at the picture, but it's funny how there's this comic truth I find in his words from this picture of a Young Parisian. I cannot help but think of it more like a comic relief. There's no air of chic about him, but his confidence altogether in going out in the streets looking like that inspires this sense of individuality. These colors are so Paris – it is city-camouflage! I like the combo of practicality (or comfort) and poetic sensuality as showcased in the details, particularly the patterns of scarf, sweater and trousers. Also, the corners of that linen bag and then the points of the shoes. The proportion is awful. Looks like Toulouse-Lautrec. The idea is not bad, though (except the socks). Oh, oh, oh! Beautiful! Stunning! Could I please have this entire outfit? 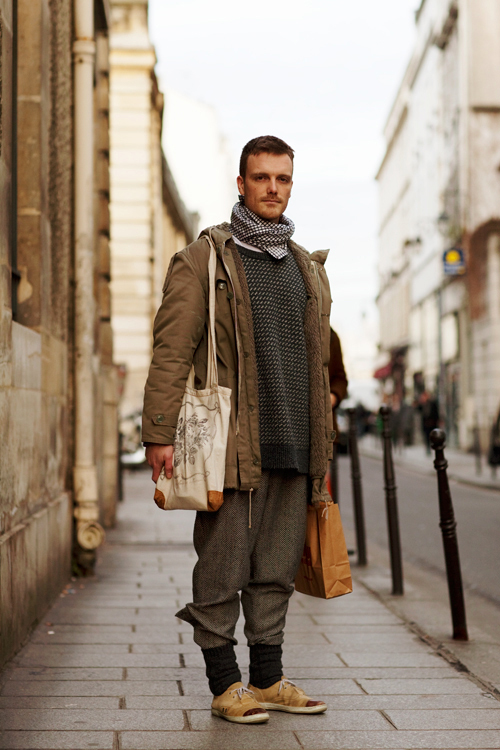 The trousers, the sweater, the socks & shoes, the bag, the scarf… It's too beautiful. The colours and materials are simply wonderful. I'm assuming he is about to get onto a bicycle or just got off of one and has been shopping. We must not be too quick to judge. I like his look and he is quite handsome. Very nice use of color and texture. Time for a pint? Thta's the old LL Bean Norweigan sweater I had in high school in the preppy 80's. Interesting combo. Hmm, two thirds of him is upper body. Waht’s wrong with legs? I hardly ever comment. But this look blew me away. The colours, textures, interesting details, proportions. Well… and he has a hot body (I can so tell despite the layers) and a gorgeous face. This man needs boots or wellies or something. His shoes are not congruent to his urban-outdoorsy look. why we here in Finland do not have as stylish men as he? SWEATER : one I nicked from my dad, he's been using it for outdoorr work and working on cars and stuff for 15-20 years..
Once again, fashion following necessity. Pants are tucked into socks so they don't get caught in the chains when riding a bicycle. Amazing how a form of art follows a constantly changing collection of necessary necessities! Bravo humanity! I don;t like this at all; the proportion is pretty unflattering. For some reason I'm drawn to this look so much. I have no idea why. "its amazing to know how many ppl around the world r soo fashionable." Hardly amazing. The vast majority of people in the world either cannot afford food let alone designer threads or can afford to look presentable but lack the drive, care and respect for others. he's so damn cute but he's not from Paris!!!! he would be an llama? Parisian in an LL Bean sweater? I don't think so. Cool outfit, though. lovely guy, smart choices, but the "pants-in-socks" has got to go. not a good look at all! Looks like he tied the scarf carefully to meet the pattern of the sweater– very nice. I like strange intentional proportions! What about Coco Chanel???! I want to learn to tie a scarf that way. sorry folks, the emperor has no clothes … well at least the emperor's clothes are TUCKED INTO HIS PANTS!! if he's two strides from hopping aboard his trusty steed, er, Schwinn, then he's got a pass from me (but, then only for the right pant leg!). agreed that the rest of him is quite the stylish rake. -Jg. don't love this one. It makes him look incredibly disproportioned (is that even a word) and short. I guess I'm a fan of lengthening the leg and not the torso. I love the French!!! C'est tout! I wish EVERYONE would look like this! I love it,it s the perfect winter style for my! no..simplicity always works when it comes to men! Love the outfit. Can anyone please tell me what the name of that scarf knot is? Love the style, but no, he is not French. He is Danish. I just love this look. Probably because this is exactly the way I dress (not purposely ;) to impress – especially in the fall.. it's really comfy, you drown in your clothes and it is something else. Living in Vienna I do see some quite bold fashion choices, but a look like this one stands out!